“It was like seeing twice,” Cézanne once remarked, about his painting. And we might say the same about viewing Christophe Gardner’s photographs. In them we find the everyday world we recognize, but now familiar scenes are set before us more clearly, crisply, through these precise and gleaming photos. Images we recall and new ones come before us with definition, illumination, and shading. But then we’re struck by the emotion that infiltrates each photo: the tenderness toward human faces and bodies, the anger at senseless violence, the adoration of places that have been well-lived-in. Our photographer is a poet of the visual, like Neruda who wrote thousands of love poems and odes to common objects, to salt and socks, watermelon and wine. Christophe Gardner’s work reminds us to love being mortals who are embodied, to observe carefully those around us, to embrace them with our sight. Reminds us that our cities gleam with ancient histories barely buried, that our villages are teeming with hidden angels in unsuspected guises, that red shoes can be jewels and scarves on elderly women can be sculptural. Christophe’s portraits of children are particularly moving. In one photo by the water, the children are athletic little boy-angels springing into the air. We know they must come down. But not in Christophe Gardner’s photos, where the eternal and the moment meet. The images suggest, do not insist. They are subtle and invite us to return to them. We are seeing not twice, but many times over, through the richness of Christophe’s photographic mastery and memory. ––Marilyn Kallet, author of 17 books, including The Love That Moves Me, poetry, and translator of Paul Eluard’s Derniers poèmes d’amour, Black Widow Press. Christophe Gardner was born in Paris in 1960. He is the son of an american professor, founder of several american schools around the world - and of a french journalist and award winning author. 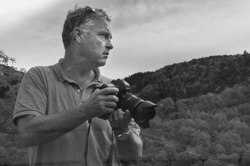 He has lived in several countries including France, Spain, Israel, the United States and Canada, but his work as a photographer has led him to many others. Christophe Gardner discovered his interest for photography at the age of 13 and is self taught. He served as a photographer in the french navy and until recently worked as a press correspondant. His photographs can be found in private collections around the globe. He is currently living in the south of France but continues to travel the world.